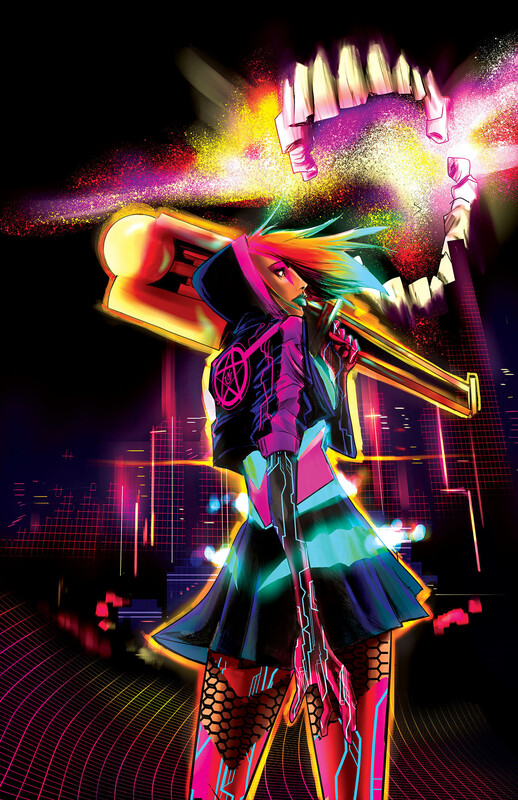 NYCC 2018 first look: Zöe Quinn's 'Goddess Mode' tackles the perils of technology run amok – AiPT! Quinn makes the jump to comic books in one of the DC Vertigo relaunch’s most hotly anticipated title. Amongst DC Vertigo’s new stable of writers is Zöe Quinn, another creator from another medium making the jump to comics in the imprint. The Depression Quest developer has a unique insight into the unlimited potential of technology, for both good and bad. Enter: Goddess Mode. Goddess Mode was announced by DC back in June, and is described as taking place “in a near future where all of humanity’s needs are administered by a godlike A.I.” It’s up to lead character Cassandra to do tech support for it. Cassandra will be an endearing character, but like most of Quinn’s protagonists, also a “total mess.” “My favorite DC character is Harley Quinn, because she’s a disaster,” she joked. Goddess Mode has a definite cyberpunk feel to it, taking place in a dystopian future where technology has run amok. The story is presented by Robbi Rodriguez’s vibrant, stylish art, which really helps enhance the mood of the story. Panel goers at New York Comic Con were treated to never before seen artwork for the comic, which you can see below. Goddess Mode #1 hits shelves December 12.